Sunday morning and off to Olympia Café in Kalk Bay with my cousin and his 2 kids. Olympia Café is a rustic bakery and deli with fantastic food – breakfasts, lunches and dinners. I have eaten breakfast at Olympia Café many a time and have never been disappointed with the selection, quantity or price of dishes. Today was no different! We arrived and promptly posted our name on the board along with the number of seats we required – 5 (one is unable to pre-book, merely arrive and wait a few minutes). We waited a whole 10 minutes before being taken to a table in a corner, for which we were quite grateful as it was quite noisy inside. In times when the wait can be quite long (especially for large tables), I recommend leaving 1 person waiting and the rest of your party can go for a short walk along the path between the road and beach and look at all the lovely antique and art shops. We sat down and were served very promptly by a friendly face. By the way, they make fantastic cappuccinos! We waited an extra bit for 1 coffee as they were brewing a fresh pot. From the selection of breakfast goodies on the blackboard, we put in our order. Menu options change daily based on the fresh ingredients available. Not even 15 minutes and all our food arrived looking gorgeous. A simple, freshly baked “pain au chocolat” (chocolate croissant) which was filled with a dark / milky chocolate, was heartely enjoyed by our youngest member of 9. I tucked into a fantasticly bulging omelette filled with brie cheese, sweet potato and butternut and served with a side of the best ciabatta I have had thus far (R45). 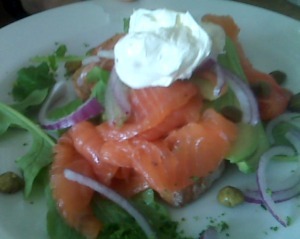 My cousin chose a salmon gravadlax with cream cheese, avocado and rocket on rye bread (R55), which he thoroughly enjoyed. It looked really fresh and healthy. For an even more healthy breakfast option, strawberries, yoghurt and honey were also featured on the board. My cousin’s daughter of 12 ate all of her grilled croissant, smothered in ham, ementhaler cheese and rocket (once again) (R34) and last but not least our 5th party member had 1 of the baked croissant options – a choice of spinach and feta, mushroom and mozzarella or ham, mustard and mozarella. 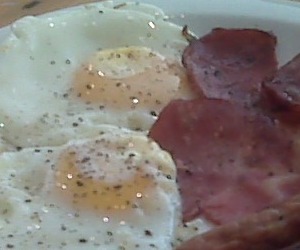 At R24, these make a fantastic choice for a reasonably priced, yet filling breaky. Our bill for 5 people came to R248 in total. Not a bad way to start a wonderful Sunday! It is a moody-weather Thursday morning and I am meeting my team for breakfast to celebrate a colleague’s birthday. Bon Fromage in Newlands is the venue of choice for this first meal of the day. Sitting on the busy main road of Newlands, in the Southern Suburbs of Cape Town and opposite the South African Breweries (SAB), Bon Fromage is a French-style bakery and cheese café. They have a simple, healthy and rustic selection of menu options covering breakfast and lunch, and a wonderful deli refrigerator filled with a vast selection of cheeses and a wooden rack of gorgeous crisp, fresh breads. The party of peeps took a while to decide what they wanted as it all looked so good. The birthday boy decided on the traditional fry up breakfast which looked great, however, the pork sausages seemed a little bit anorexic. Someone took the most expensive choice on the menu (at R55.00) “Bon Fromage French Breakfast” consisting of a fresh fruit salad with a yoghurt and sour cream topping, followed by a platter of meats and cheeses and freshly baked bread. Comment was that it was good … but not fantastic. 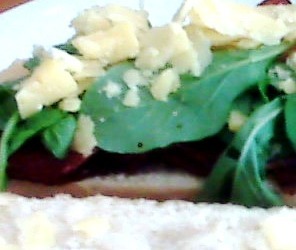 2 colleagues chose the ‘blt baguette’ with crispy bacon, roasted tomatoes, rocket and parmesan shavings. The baguette was a little bit too crispy to eat as a traditional closed blt sandwich. 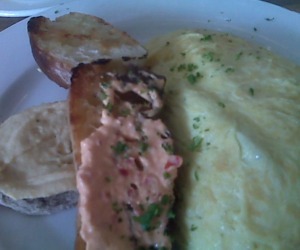 I embarked on a croissant (instead of baguette) filled with salmon (instead of bacon), omelette-style eggs and oven roasted tomatoes. Was delicious! Coffees, hot chocolate and cappuccinos all round. The atmosphere is very relaxed so much so that the service is a little slow and with a small kitchen, breakfasts for a large group might not all come out at the same time. But it is very pleasant sitting in the calmness of the interior with the hustle and bustle of life happening on the outside.